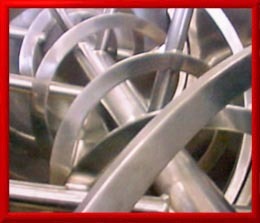 The machine you see above is called a ribbon blender. It is a type of mixing machine used to blend or intermix the ingredients for a powdered food or drink product. Powdered beverage base mixes are prepared in bulk in a machine like this. All the ingredients such as the sugar, food coloring, flavoring, and other additives are added to the batch in the correct proportions and then this machine runs for a preset time to thoroughly blend and intermix all the ingredients throughout the batch. This is done in batches that weigh several thousand pounds at a time. After the blending is done the machine is stopped and a valve is opened in the bottom of the machine and the product gets metered out onto a sifter screen where any big clumps get separated out. Sometimes the powder is not fine enough after the blend is done. In those cases the powder gets fed through a rotary hammer mill to grind it up into a finer particle size. Once the powder is sifted and sized right, it is passed to a screw auger conveyor, which then takes the product up an inclined tube where it is then discharged into lined plastic drums waiting below. The drums of premixed product are sealed until they are needed on a packaging line where the bulk product will get dispensed from the drum into the bulk feed infeed hopper of a packaging machine. The packaging machine then meters out the product at intermittent intervals into individual serving sized containers or packages. I have added AC variable drives to these machines to reduce the stress on the mechanical components during start and stop. I have also set up the overhauls by outside contractors for these machines because the tools needed to service these machines in house cost thousands of dollars each and it does not pay to buy them for the frequecy at which they are needed. It would be like cash sitting dead on the shelf. The pillow block bearings used by these machines weigh over 130 lbs each. Check out nthe slide show to see what it takes to change them out.